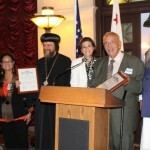 LOS ANGELES, July 11, 2013 – The Bishop of the Coptic Orthodox Diocese of Los Angeles, His Grace, Bishop Serapion, along with local Muslim Public Affairs Council (MPAC) leader Dr. Hathoot Salam, were presented with a certificate of acknowledgement from the City of Los Angeles Human Rights Commission (CLAHRC), at the Annual Iftar dinner (July 10, 2013), highlighting His Grace’s promotion of peace, love and dignity. 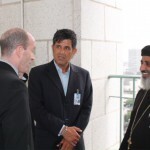 “We thank the Human Relations Commission for their hard work and we recognize the need to have a productive dialogue with one another.” commented Bishop Serapion. 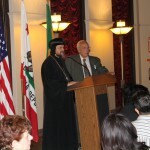 Following the event, Bishop Serapion responded directly to the Mayor with a letter of thanks and encouragement on behalf of the Coptic Christian Community in Los Angeles and the surrounding communities on the enhancement of societal improvements regarding inter-faith peace and relations. 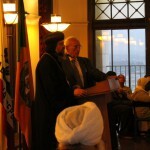 The Coptic Orthodox Church of Alexandria is the largest Christian Church in Egypt and the Middle East. The Church was founded by St. Mark the Evangelist and Apostle in 42 A.D. Today, Coptic Christians are led by His Holiness Pope Tawadrous II, and make up about 10-15 percent of Egypt’s population. 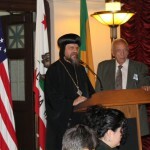 With over 30 parishes, the Coptic Orthodox Diocese of Los Angeles and Hawaii’ is the largest Coptic diocese outside of Egypt. 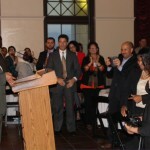 Led by His Grace Bishop Serapion, the Diocese of Los Angeles accounts for 12,000-15,000 families. Continuous persecution of Egypt’s Christian population paved the way for a Coptic Diaspora throughout the world, with a great number finding refuge in the United States where Christians are given the same opportunities and freedoms as everyone else. 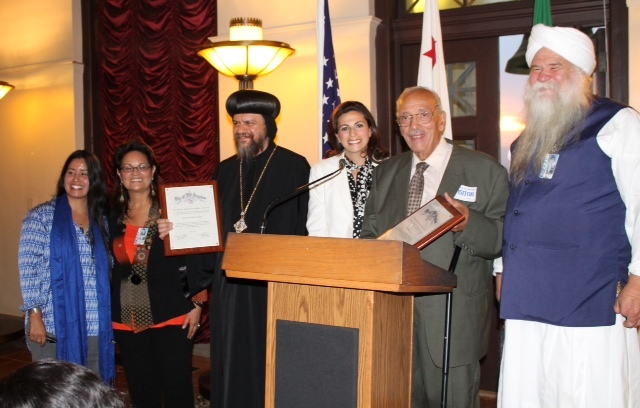 Today, the Coptic Orthodox Diocese of Los Angeles serves to create strong ties with the community at large and improve relations with other churches and faiths, while still preserving and sharing the Church’s rich and ancient heritage.